Check out our new Mazda inventory. Hear from our past customers about their experience at Marketplace Mazda. Take a look at our certified pre-owned inventory and find your next car. Get approved for financing today. Mazda vehicles are not just cars. They are designed for the passionate, built for the enthusiast, and delivered for those looking for something different. 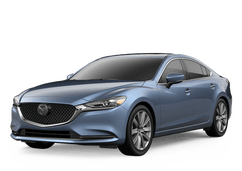 See the Marketplace Mazda inventory for yourself, and learn more about impressive models like the Mazda3, Mazda6, Mazda CX-5, Mazda CX-3, and others. We have more than just a new inventory. We also have a comprehensive used inventory that includes a wide variety of vehicles from different brands. Of course, we also have an extensive pre-owned inventory of Mazda models. If you need Mazda parts, maintenance, or service, we can take care of that too. Let us help you live Mazda. Since 1981, our family has been proudly serving the Rochester area, and we’ve been with Mazda for several years now. We have regular customers from all across the region including cities and communities like Henrietta, Brighton, Webster, Greece, Victor, Penfield, Irondequoit, and many more. You can come see our impressive inventory for yourself today, or you can browse through everything we have to offer online.